Relationships can be complicated. Marriages even more so. I live and breathe Creating A Haven of Peace, intentionally striving everyday to make our home, our work, our play … peaceful. And when I speak on this subject I invariably have people who want to know if it is too late to create peace and love in their home. Perhaps they have had many years, or even decades of distance, strife and lack of intimacy. My answer is that it is NEVER too late to begin again. It is never too late to change behavior if one is willing to do the work…consistently and intentionally. Begin with small steps. One of my favorite authors is Michael Michalko (ThinkerToys) who says, “An easy way to improve or elaborate on any subject is to take it apart and improve or change one part at a time.” He uses the example of renovating a house with many rooms. Each room has an important functionality. If you want to change the nature of the house you don’t blow it up or build a new one. You take one room at a time and make the desired changes. You can do that in your home and you can do that in your life. Every relationship is a house with many rooms. In the Miller home, we didn’t have problems. We had opportunities for solutions. Just a change of wording can totally change your perspective. If we had miscommunication, how could we create a better way of communicating? If we had misbehavior, how could we set a better example and deal with the behavior in a way that seemed more like a learning experience rather than punishment? It’s all about how creative you want to be. I think sometimes we get so caught up in how things have been done in the past that we greatly limit the possibilities that make for better, harmonious living. Taking one room at a time, figuratively or literally, may gradually build beauty and peace into your everyday that is far more desirable than blowing up the whole house (divorce, separation, shunning). Looking for ways to change small behaviors, serve others, bring more beauty and kindness into their lives, pays big dividends in relational bank accounts. Write a note today to someone who won’t expect it. Your spouse, your child, your parent or even a friend. Make it a love note, a note of appreciation or encouragement. It will be a blessing to you and to the recipient. Do it again next week. And the next. 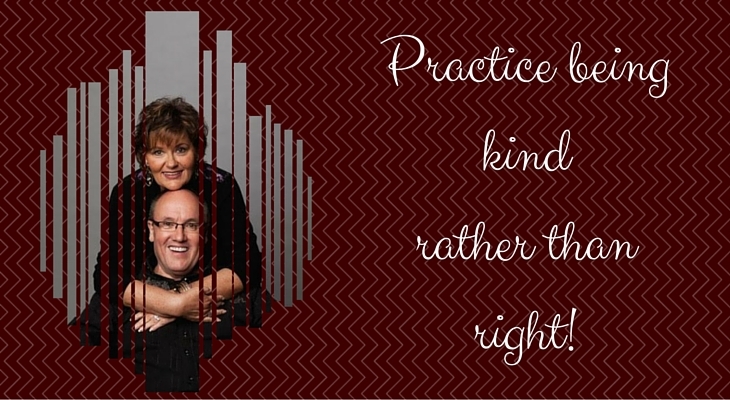 When anger or frustration rears its ugly head, remember it is more important to be kind than it is to be right. Can you have a disagreement and make it a win-win for both of you? A loving relationship is not one of competition. Discuss kindly instead of arguing. If you are a husband, schedule a date night and surprise your wife with a babysitter, a night out with no responsibilities. Do this as often as you can. Guaranteed to change your relationship. Don’t spend the time together talking all about the kids and/or work. Talk about your relationship, your dreams, goals and desires. Write down what you admire about your spouse or child or whomever. Give that person this unexpected gift of appreciation in the form of a letter, a journal or just a post-a-note on the bathroom mirror. The more you concentrate on the good, the positive, the less the negatives will creep in and overtake your thoughts. Do this often. Go outside and gather flowers to grace your dining room table or the coffee table in the living room. Just this one small gesture of beauty in your home can make a huge impact. Make a practice of playing soft background music in your home to set the tone of peace and loveliness. It will calm the spirit. It doesn’t take a lot of money or a lot of hard work to do the little baby steps that enrich a marriage and fill a home with peace. What little things do you do in your home to instill peace and harmony? I’d love to hear from you.